The Amazon stock price skyrocketed 105% over the last year, but it's not too late to capture even more long-term gains. Yes, $2,000 per share may s1?eem expensive in the short term. We can't prove it, but Money Morning Defense and Tech Specialist Michael Robinson must own a crystal ball. Back on Oct. 30, 2013, he said that the Amazon.com Inc. (NASDAQ: AMZN) stock price would trade for $1,000 per share. That was one of the boldest AMZN stock price predictions anyone has made, as shares were trading for just $362.62 at the time. It took a few years for the everyone else to catch on, but investors who listened to Robinson in 2013 were thanking him on May 30, 2017. That's when Amazon first traded for $1,000 per share. That's a gain of 175%, and it turned roughly every $10,000 investment into $28,000. More than a few people could have used that money to pay off a credit card bill, put a down payment on a house, or take the family on a nice vacation. California is bracing for an enormous wave of wealth – and if you play your cards right, you could make more money from the marijuana markets than you’ve ever seen in your life. 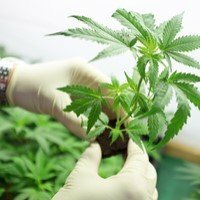 You see, thanks to the Golden State’s complete cannabis legalization, $20.2 BILLION is expected to flood this industry, delivering massive upward momentum to tiny cannabis startups currently trading for pennies apiece. But as soon as the money starts flowing into these small companies, and their share prices go from $1, to $5, to $20 or more… you may never see a chance like this again. Your first step toward on the road to marijuana millions starts right here. As his "conservative estimate," Robinson believes the AMZN stock price will eventually trade for $3,000 per share. "For the past three years, Amazon has grown its earnings per share by roughly 99%. Just to be conservative, let's cut that figure way back… to 25%. At that rate, the firm's per-share earnings would double every 2.8 years. Because stock prices tend to follow earnings growth, this is a stock that actually has the potential to double in less than five years," Robinson said on Sept. 5. As Amazon earns more money, more people want to own shares of Amazon. 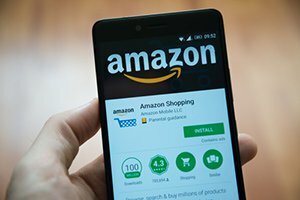 With more demand for AMZN stock, the price goes up. And Robinson believes Amazon will keep increasing its revenue because of cloud computing and its hardware. In Q2, Amazon increased its Amazon Web Services (AWS) sales 48.9% to $6.1 billion. Over the past three years, AWS sales have risen 255%. The cloud services unit also accounts for 55% of Amazon's operating income. On top of the impressive sales from AWS, Robinson believes Amazon's speaker device, Echo, is going to be a cash cow for the company. Just look at the convenience the device is bringing to customers' homes. Amazon Echo owners in select states can create a shopping list and have their food delivered to their home within two hours, all by just asking the AI-powered assistant Alexa. It's convenience like this that will have more people buying Echos and using Alexa to buy products off Amazon or Amazon-owned entities. "Amazon is one of those success stories that proves the investment thesis I have laid out for you many times over the last several years: The road to wealth is paved by tech," Robinson said on Sept. 5. In 2017, the North American market for legal weed was just over $9 billion. Along with additional states in the U.S. –the legal marijuana industry is set to explode. This could secure your future, if you act fast.